PBS plans to air some great shows on Labor Day! 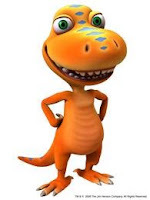 Don't miss the debut of Jim Henson's new Dinosaur Train show. I'm betting my son will enjoy watching it. He loves his choo-choos and dinosaurs! It's back-to-school with a new WordWorld episode! My daughter is looking forward to showing off her favorite things at show-and-tell during school, and it looks like the WordFriends get to show off a few of their own possessions as well. What will Duck take? View a special sneak peek clip to find out! Don't forget to check out the http://www.wordworld.com/toolkit/ for coloring sheets, WordWorld printables and activities! The WordFriends coloring pages are really neat. Kids can color and learn how to spell words at the same time! My daughter colored FROG to take to show her teacher. Their class pets this year are frogs. what a cute and informative blog! I will share with my mommy pals! Thanks for entering our kid's book giveaway!